Kimbers delivery service operates to any address within 30 miles of our head office: Unit 1a Somerford Business park, Wilverley Road, Christchurch, BH23 3RU. Anything outside 30 miles radius can only be ordered for click and collect. Carpets, flooring and accessories - Standard delivery charge of £10.00. This charge is to one address for as many items as you like. Anything you order will be dispatched from our Christchurch warehouse and we aim to have delivered to your door within 5 working days. Our depot will contact you once your order has been placed and arrange a convenient time and date for delivery, if it's outside the 5 day period that's not a problem we can arrange it to suit you, however all orders must be delivered within one moth of being purchased. This Free service makes your flooring or accessories available for you the next working day or if you're in a hurry, call us and we will try and arrange same day collection. Please ensure you have a vehicle suitable for your products due to the bulky nature of carpets and flooring. The collection address is our head depot: Unit 1a, Somerford Business Park, Wilverley Road, Christchurch, BH23 3RU. Our delivery timescales of 3-5 working days are a good guideline, however due to unforeseen circumstances are subject to change. Whilst we aim for 3-5 working days delivery we cannot guarantee it. For more details on delivery please visit our terms and conditions or call 01202 480900. Our team of professional fitters are ready and waiting to fit your new flooring. For extra piece of mind all of Kimbers fitters have public liability insurance up to £2 million and are fully vetted by Kimbers. At Kimbers service comes first, this makes us different to the rest. Our competitors are known to take your flooring up and then leave you to dispose of it. We offer an uplift and disposal service. We will do all the work so you don't have to. No one wants their old flooring left in the way to get rid of themselves, let us do it for you. We will move furniture and work around your needs to make what can be a daunting task, hassle free. Once your flooring has been fitted our skilled craftsmen will tidy up and Hoover up after themselves. On top of the manufacturers guarantee, Kimbers like to offer even more assurance by guaranteeing all of our installations for one year from the installation date. 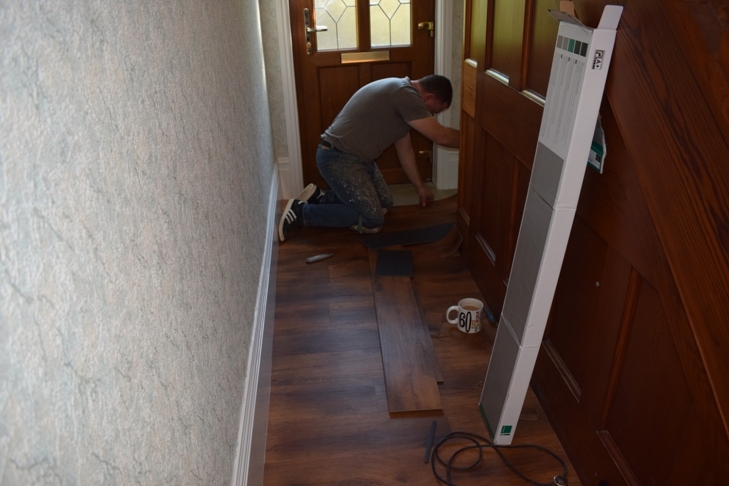 This means in the unlikely scenario that you have any problems which involve the fitting of the flooring we will put them right for the first year free of charge.